Calibration Products - Cameron Instruments Inc. | Cameron Instruments Inc. | Cameron Instruments Inc. The New HPC50 handheld pressure calibrator is an intrinsically safe, dual pressure calibrator with options to add an additional two external pressure or temperature modules. 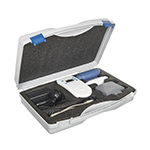 The Aeroqual Air Quality Testing Kits feature the Series 500 portable monitor. They have two Outdoor Kits (Starter and Pro) and three Indoor Kits (Starter, Pro and WELL) making is easier than ever for people to measure the air around them. Canada Sensors Technology Inc. (CST) manufacturers Smart intelligent transmitters that are available in intrinsically safe designs for hazardous locations and also general purpose models for non-hazardous applications.